Papua New Guinea Prime Minister Peter O’Neill has assured United States President Barack Obama and leaders of the Group of Seven (G7) nations that the country is determined to achieve sustainable development goals. The G7 economies are the United States of America, United Kingdom, Japan, France, Italy, Germany and Canada. Their outreach meeting was held at Ise-Shima in Japan from Thursday to Saturday last week. 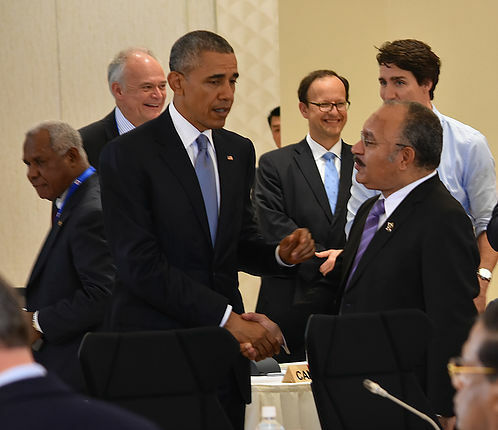 PNG was among a small group of developing countries invited to the meeting. Addressing the meeting in his capacity as the chairman of the Pacific Island Forum, O’Neill focused on quality infrastructure, the global economy, trans-Pacific partnership, the need for securing open and secure seas and the achievement for sustainable development goals ― particularly in health, women and development issues in Africa. He said PNG adopted the development goals in 2015 with the national development plans and policies, aligned with Vision 2050 and the Medium Term Development Plan (2010-2030). “On the Millennium Development Goals, PNG is fully aware of its obligations and is making investments in key drivers of the economy, including improvements to these key social indicators,” O’Neill said. He said in recognising and appreciating humanity, the key focus of the goals, PNG was fostering multi-stakeholder partnership, guided by national ownership and leadership on human rights protection and the promotion of this national development agenda. O’Neill commended Japan for the initiatives and re-assured the support of PNG and the Pacific forum countries for the initiatives. He said they resonated well with the region’s own efforts towards ensuring security, promoting public health and ensuring gender inclusiveness. “Furthermore, at the global level, PNG’s efforts to safeguard and protect human rights are consistent with and guided by international commitments and obligations under several multilateral frameworks, including core human rights instruments,” O’Neill said. O’Neill held brief meetings with Obama, prime ministers Matteo Renzi of Italy and Justin Trudeau of Canada, and President Hollande Francois of France. He also met with leaders of international organisations such as the World Bank, International Monetary Fund and European Union. He also met United Nations Secretary-General Ban Ki-Moon.